2.1 Is my coin biased? Here we look at some simple questions in probability: from tossing a coin, via Pascal's triangle, to the binomial distribution and the ubiquitous "bell curve". "Let's flip for it! Heads or tails?" Tossing a coin is an age-old method for settling disputes, and for picking between a pair of outcomes. Even the Romans used to flip coins, although they would call navia aut caput ("ship or head"). Here p(head) is the probability of the coin showing the head when it lands. The probability of an event is a real number from 0 to 1, with 0 meaning "it never happens", and 1 meaning "it always happens". The probabilities of all events adds up to one, meaning that all possibilities are accounted for, i.e. (Of course, the coin may land on its edge, or be swallowed by a seagull in mid-air, etc., although I've never seen this happen so, for simplicity, let's say the probability of all other eventualities is 0). Now let's flip a coin twice in succession. What is the chance of getting two heads? Easy, it's 0.5 x 0.5 = 0.52 = 0.25. In other words, it should happen 1 time in 4. To find the probability of two independent events occuring, we simply multiply together the probabilities associated with two individual events. Crucially, this works because the two events are considered to be independent: the result of the first event does not affect or influence the second event. In many real-life situations, when two rare events are wrongly assumed to be independent, multiplying their probabilities leads to underestimates for their combined probability, which can result in miscarriages of justice; or nuclear meltdowns!. Likewise, the chance of getting two tails in succession is the same, 0.52 = 0.25, or 1-in-4. The first coin lands heads down (tails up), and the second lands heads up. In this case, we add together the probabilities of the two possibilities. So the chance of getting one head and one tail is p = 0.25 + 0.25 = 0.5. That is, it happens every other time (1 in 2). Try it! where (e.g.) HTT means "first we get a head, then a tail, then a tail". where C(k, n) is the number of different ways of arranging the characters in a string HHTHTTHTH... which features k H's and (n - k) T's. The probabilities p(k, n) for all 0 <= k <= n describe a Binomial Distribution. C(k, n) is known to mathematicians as the Binomial Coefficient, and is commonly denoted as . It is sometimes called "n choose k", expressing the idea that it is the number of different ways of choosing k items from n possibilities -- here, the k positions of the H's in a string of length n.
For instance, the fifth row is made up of the coefficients "4 choose k", reading across from left-to-right k=0, 1, 2, 3, 4. (a + b)4 = 1 a4 + 4 a3 b + 6 a2 b2 + 4 a b3 + 1 b4. It should not be a surprise that binomial coefficients make an appearance here, since the coefficient of (e.g.) a2b2 is simply the number of ways of arranging two a's and two b's (e.g. aabb, abab, abba, baab, baba, bbaa). Every number in Pascal's triangle is the sum of the two numbers immediately above it. This gives us a simple recursive method for calculating Pascal's triangle, and thus the set of all binomial coefficients. Alternatively, to compute an individual coefficient we can use the factorial formula given here. Imagine flipping a coin 1000 times, and counting the number of heads. "On average", we would expect to get 500 heads. But if we got 502 heads, or 497, say, we would not suspect that the coin is biased: this could very easily happen "by chance". On the other hand, if we got 700 heads (or 300) we would strongly suspect that the coin was dodgy! This raises a question: roughly speaking, what is the minimum level of deviation from the average that should arouse our suspicion? In fact, this is perhaps the fundamental question in the scientific process. When can we say beyond reasonable doubt that a particular measurement is inconsistent with a certain model? For example, is a measurement of 700 heads out of 1000 inconsistent with the model of an unbiased coin? (Yes). Flipping a coin once is rather fun, but flipping it 1000 times is tedious! So to examine the statistics of multiple coin tosses, we can use a Python program, making use of the random module. This gives the number of heads found in 1000 tosses of an (unbiased) coin, in 10 separate trials. You should find that the numbers are all in the vicinity of 500 -- and certainly nowhere near 700. 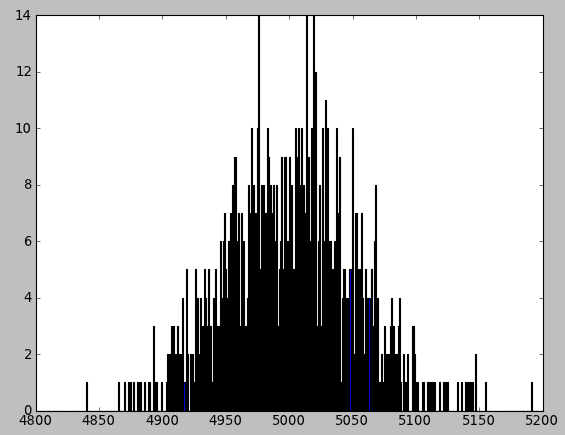 The distribution is centred around the "average" of 500, and it falls off on either side. 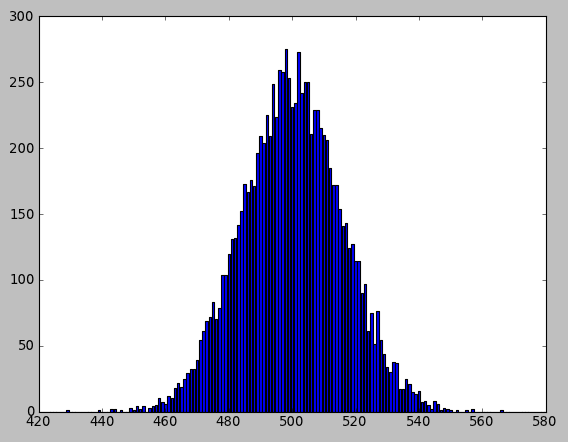 The shape of distribution looks a bit like a "bell", but with some random fluctuations. The width of the bell, from shoulder to shoulder, seems to be around 40 (the majority of scores are in the range 480 to 520), and from foot-to-foot, around 100. All of the 1000 trials shown here have resulted in between ~455 and 555 heads. Try reducing the number of tosses per trial (n), and the number of trials. What do you find? The distribution is smoother; the fluctuations have been reduced. However, the width of "bell" has stayed approximately the same. The average is ten times larger (obviously). However, the width of the bell has only increased by a factor of about 3 (from 40 to 120). Let's try to understand why. To find the "mean" average, we should divide the sum of the number of heads in each trial by the number of trials. Variance is a measure of the expected square of the width of the frequency distribution. It is defined as the mean average of the square of the deviation from the mean, in other words, the sum (taken over the number of trials) of the square of the deviation from the mean, divided by the number of trials. The standard deviation is the square root of the variance. Roughly speaking, it should correspond to one-half of the width of the "bell" measured from shoulder-to-shoulder, or one-sixth measured from base-to-base. 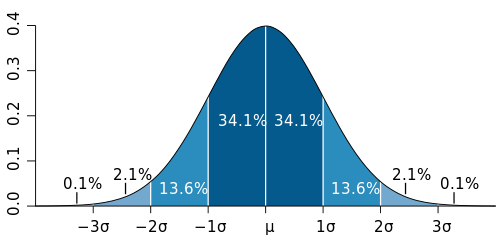 See the diagram of the bell curve below for an illustration. Exercise: Write a Python program to compute the mean, the variance and the standard deviation of your simulation data. Our observations above can be understood by considering the mean and variance of the Binomial Distribution. The mean of the binomial distribution is n p. In our case, n is the number of tosses in each trial, and p=0.5 is the chance of a coin landing heads up. So the mean of 1000 tosses is 500, as expected. By similar logic, the fluctuations in the distribution will have a standard deviation of sqrt(t) / 2, where t is the number of trials. Their relative magnitude will scale in proportion to 1/sqrt(t). So fluctuations diminish in relative magnitude as t is increased (just as we observed). 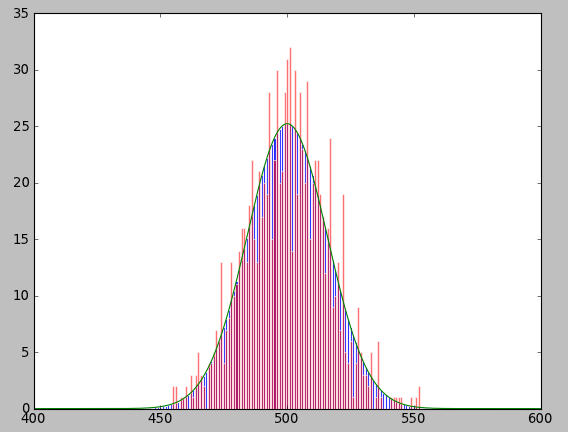 Here μ is the mean, and σ is the standard deviation. We see that, from "shoulder to shoulder", the bell curve has a width of 2 σ. 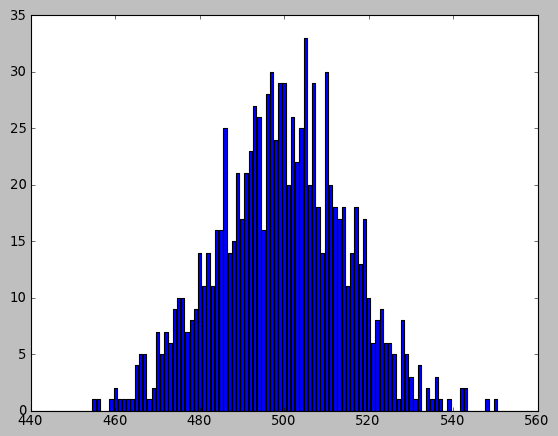 Roughly 68.2% of the area of the distribution is within one standard deviation of the mean. (where C(k,n) is the binomial coefficient) tends towards the normal distribution formula, after inserting x = k, μ = n / 2, and σ2 = n / 4 in the formula above. Exercise: use Python to generate a similar plot for yourself.